This December I’m resigning from the SCOPE team after two wonderful years editing the ASC newsletter. When I first applied for the editor role in 2015, I was a relatively recent recruit to science communication. I was mid-way through my Masters of Communication (Science) and had just commenced work as the communication officer at the ARC Centre of Excellence for Engineered Quantum Systems. Academically and ‘experimentally’ (I’ve spent too long around physicists), science communication proved a fascinating challenge and I knew I was keen to pursue work in the field, but I didn’t really know anyone in the space beyond my scicomm class. Joining the Australian Science Communicators was the first step for building networks in the Aussie science communication scene and, a year later when the position became vacant and previous editor Victoria left Australia for exciting UK adventures, applying for the editing position was the second. Working with my co-editor Jess Scholle, Kali Madden, and two Presidents (Joan Leach and Craig Cormick) and discovering what science communication looks like around Australia has been a wonderful experience. So – thank you to all our regular contributors and the whole ASC team! I won’t disappear from the ASC as I step into a new role as President on the SEQ branch. Hopefully I can live up to the wonderful ASC tradition and take some inspiration from the events and activities I have witnessed through editing SCOPE. Happy reading, everyone, and happy holidays! Who needs science journalists anyway? Thank you to Bianca Nogrady for this piece! According to this report from Undark magazine, the National Association of Science Writers in the US is experiencing an all-too-familiar existential crisis; who exactly are they? Unlike the ASC – which accepts executive and council members from across the broad church that is science communication and science journalism – positions on NASW’s board are limited to professional journalists. But that looks set to change with the recommendation from an ad-hoc committee that the executive be opened up to science writers and ‘public information officers’ (who we call science communicators). Many science journalists within NASW appear to oppose the move, while the majority of science communicators and PIOs are in favour. This tension exists within the ASC as well. The organisation was founded by a mixed group of science journalists and science communication professionals, and we share a common passion for the communication of, and about, science. But, as has been discussed a lot lately [see this video of last year’s ASC NSW event on this very topic] , science journalists and science communicators are different creatures, with different and sometimes competing agendas. If we try to play down these differences or pretend they don’t exist, we risk making the ASC irrelevant to one or another of those groups. There’s no doubt science journalism is on the back foot in Australia, if not the world. We have very few dedicated science reporters in the mainstream media and most of the science journalism is being done by freelance journalists who also derive income as science writers and communicators. It’s worth pointing out that not many of these in-house or freelance journalists are ASC members; something we’re working to change. Cosmos magazine is fighting the good fight to keep long-form science journalism alive in print, but as we heard at the recent ASC conference in Brisbane, it’s a tough battle. So why should the majority of ASC members, who define themselves as science communicators, care about the fate of science journalists, either within the ASC or outside it? Because now, more than ever, we need to support, encourage and nurture science journalism in Australia. Who else would be in a position to uncover our own government’s censorship of international reports on the state of the Great Barrier Reef [http://www.theguardian.com/environment/2016/may/29/australia-covered-up-un-climate-change-fears-for-tasmania-forests-and-kakadu], report on scientific fraud, or get the general public caring about gravitational waves? Science journalists bring science – warts and all – to the general public. The rift within the NASW is raising the prospect that science journalists will desert that body en masse and form their own organisation. The fact that they have the numbers to even contemplate this is probably only a factor of the sheer population size of the US. In Australia, such an organisation would be dwarfed by the Flat Earth Society or Trump Supporters For Climate Change. Some might argue that journalists have the Media Entertainment and Arts Alliance –the union and peak body for journalists – so why don’t science journalists stick with that? Speaking personally; I’d say because it’s boring. At ASC meetings, and get-togethers with fellow science journos/writers/communicators, I have the kind of conversations that leave my brain buzzing for days. As a science journalist, I have so much more in common with someone who works as a PIO for a research organisation than I do with a journalist who works in-house for a metropolitan daily covering the court round. Science journalists, like science communicators, do what they do because they are drawn to science. Whether they see themselves as a cheer squad, critic or impartial witness, it’s about science. The Australian Science Communicators was named as such to make it as inclusive as possible. I hope we can keep it that way. John Cook is the Climate Communication Fellow for the Global Change Institute at The University of Queensland. He created the website SkepticalScience.com, which won the 2011 Australian Museum Eureka Prize for the Advancement of Climate Change Knowledge. In 2013, he published a paper analysing the scientific consensus on climate change that gained worldwide media attention, being tweeted by President Barack Obama. The paper was awarded the best paper of 2013 published in Environmental Research Letters and is the most downloaded paper in the 80+ journals published by the Institute of Physics. John will speak on a panel discussing “How do you understand and respond to people’s rejection of science?” at the Australian Science Communicators conference in 2016. We spoke with John to find out more. ASC: What do you think the main reason is for people to reject science? JC: People are complicated so there are a variety of reasons why someone might reject a particular area of science. But a primary driver of science denial is when scientific evidence is perceived to threaten a person’s values or ideology. Prominent examples are biological evolution threatening religious beliefs and human-caused climate change threatening political ideology (namely, support for free unregulated markets). ASC: What is the most effective way to respond to this denial? JC: Psychological research has found that presenting scientific evidence to people whose identity or beliefs are threatened by that evidence is ineffective, or can even be counterproductive. There are several possible solutions to this dilemma. One is the use of messengers who share the values of their audience, framing the science in a way that doesn’t threaten their values. For example, a Christian scientist explaining the science of evolution to Christian audiences and explaining how science is not in conflict with their faith. Another approach, which is the focus of my research, is inoculating people against misinformation. Ensuring that the undecided majority is less vulnerable to misinformation is arguably a more fruitful approach in stopping the spread of denial than trying to change the minds of a difficult-to-persuade minority. JC: Science communication is essential in order for the public to make well-informed decisions. In turn, its crucial that science communicators take an evidence-based approach, heeding social science research when designing their messages. Understanding the psychology of our audiences and how people update their beliefs in response to new information is crucial to effective science communication. Interested in hearing more from John? He’ll be at the ASC Conference 2016. On March 11, the Australian Science Communicators (ASC) will bring together leading science communicators and journalists from across the globe to network and discuss current issues for science communication at QUT University, Gardens Point. Speakers include Climate Communication Fellow for the Global Change Institute at The University of Queensland John Cook, Director of Communications and Outreach at the Australian Academy of Science Kylie Walker, and contributing editor at the Scientific American George Musser. ASC President Professor Joan Leach said this year’s conference will provide direct access to leaders from industry and academia. “This is an important opportunity for busy science communicators and journalists to take a step back and look at the future of communicating science,” said Prof. Leach. Topics to be presented include understanding and responding to people’s rejection of science, the cultural value of science communication, a look at new narratives in science communication and the future of science journalism. The ASC National Conference 2016 (ASC2016) is being held in Brisbane to tie in with the first World Science Festival held in Australia. The festival runs from March 9 to March 13. 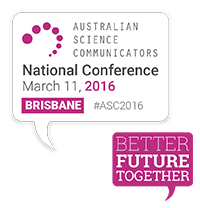 ASC national conferences have been a regular and important feature of the science communication landscape in Australia since 1996. These events are the premier networking and professional development opportunity for those making science and technology accessible. Check out the conference website for more details – 2016conf.asc.asn.au. Kelly Fielding is a Vice Chancellor’s research and teaching fellow at The University of Queensland. Her broad research focus is understanding environmental decision-making and how to communicate to increase knowledge and change attitudes and behavi our. Her research has identified ways to communicate to increase domestic water conservation, public place recycling, acceptance of recycled water and, more broadly, actions to reduce individual environmental impact. She is currently conducting research that seeks to understand the roots of rejection of science and how we might communicate to overcome these. She takes an interdisciplinary approach to her research and has worked with local council, State Government, and catchment management authorities to undertake this research. We sat down with Kelly to find out more about her involvement in science communication. KF: It’s been a serendipitous route into science communication. It developed in the first instance from work I did about public perceptions of recycled water. I got to a stage where I realised we understood what the drivers of perceptions were, but now we needed to move to the next stage of developing effective communication about this water source. It’s also grown out of collaborations that I have with biophysical researchers. I’ve found that they are hungry for input on how they can more effectively communicate their findings and this has spurred my own interest in the area. KF: My main motivation comes from my concern for the environment and our need to address the serious environmental issues that we currently face in Australia and around the world. We need to get more people interested and passionate about these issues and science communication is one route to this. KF: From a research perspective the challenges are the ones that research usually presents – what works and what doesn’t, how can we provide the evidence? For example, in relation to climate change – what are the most effective ways of framing the issue to get traction? Personally, the challenge for me is to sit back and listen more and try to find a way to connect with people’s underlying values and concerns. Interested in hearing more from Kelly? She forms part of our ‘How can we understand and respond to people’s rejection of science?’ panel at the ASC Conference 2016. Bob Bruce is a retired industrial engineer who has worked widely in government and private enterprise. He currently works as an IT Orange Card with Education Qld. He holds a double major in Psychology. He has been President of the Queensland Skeptics Association Inc since the turn of the century. Bob was ‘the Skeptic’ on 4BC’s Paranormal Panel for over five years. His philosophy is based on the rules of science and believes that science should step beyond its advisory capacity and assume a more determinate role in decision making. Bob has been involved with the Queensland Skeptics Association since the meetings took place in his lounge room. We spoke with Bob to find out more on why communicating science is important. BB: Science plays a significant role in determining our future. The world must become scientifically literate or we will perish. The older and uglier one gets the more one can look dispassionately at the world and determine what went wrong. The conclusion one draws is that the ideal pursuit for humanity is the discovery of ‘reality’ because we appear to have been pursuing something else. Humans have clouded their judgment with all manner of cultural and traditional artefacts that, given our limited knowledge at the time, helped us adapt and survive our environment. But humans also have self-interest and avarice to deal with and foibles like ‘morality’ that tries to make sense of lots of humans acting together. We have innumerable codes of ethics some based on logic or health and some based simply on the propagation of the species. Polygamy for instance served to ensure that sufficient numbers of newborns reach maturity to maintain the population but close family partnerships were frowned upon because undesirable genetic traits were expressed. We also wrongly assumed that the gods were in charge of the weather and the success or failure of the crops. We only understand these things now because of science. Science shows us the real world without our biases and prejudices. Humans relied on intuitive thinking which was often wrong. The taxonomy of the various species was originally done by intuition and was blatantly wrong in many cases. Plants that looked alike (because local environmental conditions shaped them) were unrelated and similarly animals were assumed to have quite erroneous family lineages. There is no taxonomic reason for ‘fish’ for instance. The discovery of DNA and genomics corrected the family tree. It also showed how homo sapiens spread across the world. BB: Getting people to understand the perilous state of the Earth is a big challenge. If you make a statement like “commercial fishing in the Atlantic Ocean has collapsed”, people won’t believe you. Yet, the pH of the sea has fallen 0.1 in 25 years and the sea is destined to become an acid soup. Plankton which produces 50% of the oxygen we breathe is at the very base of the food chain and has declined by 80% in some areas around the Antarctic. Our biases are embedded in our culture, prejudice and wishful thinking. We cannot be sure of the objectivity of an experiment unless it is triple blind. Ultimately science and skepticism are seen as downers even though virtually all of the world’s progress is thanks to scientific research. Information can be very touchy. Science is engaged in a ‘Hearts and Minds’ battle over fluoridation, vaccinations, GMOs and similar issues. A massive market exists for supplements and health tonics that do very little. This can be regarded as a mild amusement but ultimately it is a sham and a waste of money. As an example public disinterest and the insidious thread of unknowing anti science, look at “Super Foods”. This food movement is media savvy, sensational and often wrong. There are no “Super Foods” and no additional nutritional benefits to organic foods. On one hand we have supermarket bread – a plastic wrapped Supermarket loaf pre sliced, with bread improver, iodised salt, added folates, vitamin C, amino acids, preservatives, anti-oxidants, added flavours and colouring probably leavened with CO2 gas and formulated to stay soft for a week. The dough may be pre-prepared in Holland and shipped frozen to Australia before baking is completed locally. On the other, we have “Holistic Earth Bread”: It is a crusty high top loaf made from 1000yo variety stoneground wholemeal spelt flour with no preservatives, no artificial colours, emulsifiers or bread improvers. It is low salt. Consumers tend to prefer the crusty high top as somehow more wholesome, pure and healthy (and more expensive). However, the supermarket bread (which can be, admittedly, pretty basic) is formulated to be healthier; the added vitamins, folates and iodised salt are vital for pregnant mothers and avert birth defects in newborns. The preservatives avoid moulds and fungus that can be poisonous and contrary to popular belief they do not ‘preserve’ your insides (if only). The bread improvers improve texture and shelf life. To sum up; the challenge of science is to make knowledge accessible, believable and credible (ABC) to the populace. Interested in hearing more from Bob? He forms part of our ‘How can we understand and respond to people’s rejection of science?’ panel at the ASC Conference 2016.